Brandon Flowers "struggles" with raising his kids and having a career. The Killers frontman tries hard to find a balance between family life with wife Tana and their sons Ammon, seven, Gunnar, five, and three-year-old Henry and his "desire" to create and compete. Asked if he struggles with fatherhood and the demands of the band, he said: "Yeah. I struggle with it every day. But I do take daddy time off and I also have this strong desire to create. "Sometimes it's a desire to compete. A lot of the time I'll be competing with older stuff, like Blue Oyster Cult. I'll hear a purity in that stuff that I don't hear on modern radio and I'm striving for that sound in my own music." The 'Read My Mind' hitmaker loves hiking in the Las Vegas desert, both because it gives him quality bonding time with his sons but also to find inspiration for his songwriting.He told Q magazine: "The desert doesn't leave you. It energises me. That's where I go for inspiration and perspective, where I take my kids on a hike." Meghan Trainor and Harry Styles have written a love duet. Sia let her performers take the spotlight as usual on "Saturday Night Live" this weekend. Mark Ronson recorded 'Uptown Funk' in five cities. Louis Tomlinson is set to follow Simon Cowell into the entertainment business. Jessie J has a tattoo that features a spelling error. Musician Noel Gallagher expressed his dismay at the success of Sheeran, and the run of three sell-out nights which he will play at Wembley in July in a newly published interview. Iggy Azalea has been granted an injunction to prevent the release of her early songs by her ex-boyfriend, Maurice Williams. Brandon Flowers "struggles" with raising his kids and having a career. 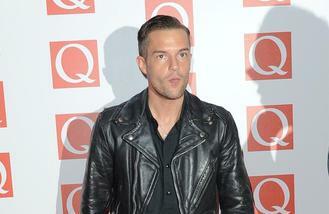 The Killers frontman tries hard to find a balance between family and career. Justin Bieber had 'amazing energy' while shooting Calvin Klein ads. AC/DC, Jack White and Drake are to headline the Coachella Valley Music and Arts Festival in April.